GAZA STRIP BORDER, Jan. 6, 2009 An Israeli soldier prays on an armored personnel vehicle in the early morning on the border of the northern Gaza Strip, Jan. 6, 2009. Over 540 Palestinians have been killed and some 2,500 others injured in the Gaza Strip during Israel's Operation Cast Lead starting from Dec. 27, 2008. An Israeli soldier was killed on Tuesday in a gunbattle with Palestinian militants in the Gaza Strip, raising the death toll of Israeli troops to six since the Israeli ground incursion began on Saturday. 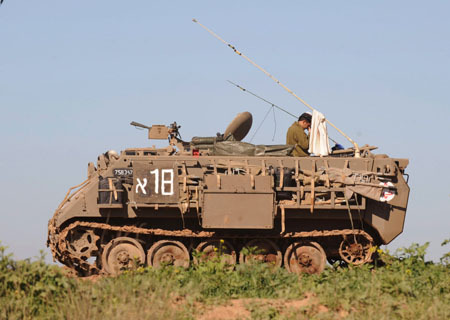 Another four soldiers, from a combined unit of the elite Golaniand Combat Engineering troops, were wounded in the morning encounter in the northern part of Gaza City, reported local news service Ynet. Earlier in the day, the Israeli army announced that three elite soldiers and one paratroops officer were respectively killed in two fiercely fire incidents in northern Gaza overnight Monday. The former marked the biggest single death toll on the Israeli side so far in the ground operation. Ten Israelis have been killed since Israel launched the so-called Operation Cast Lead against Gaza on Dec. 27. The other four died in rocket attacks by Gazan militants before the ground offensive. More casualties are likely as Israeli troops are engaged in fierce fighting in densely populated urban areas in the Hamas-ruled coastal enclave, where over 540 Palestinians have been killed and some 2,600 others injured. Israeli Defense Minister Ehud Barak said Monday that the assault will continue until the goal of restoring security to southern Israel is realized. He earlier told the Israeli public that such efforts might mean Israel would have to pay a heavy cost. Meanwhile, Israeli Prime Minister Ehud Olmert on Tuesday said that his country would agree to a ceasefire should it guarantee an end both to anti-Israel attacks by Gazan militants and to Hamas rearming and rebuilding, and that "the sooner, the better." Haneya: Israel's ground operation on Gaza "failed"
Hiding deposed Prime Minister of Hamas government in Gaza Ismail Haneya said on Tuesday that the Israeli ground operation carried out into the Gaza Strip earlier this week "has failed." Haneya said in a written statement sent to reporters that "the ground aggression on the Gaza Strip is a proof that the occupation has failed to force Gaza Strip population to surrender." He added that "this war against Gaza would be more than difficult if it was carried out against other peoples in the world, but the Palestinian people in Gaza are defeating their enemy by their strong steadfastness and faithfulness." "It's a fact that our people don't have warplanes and tanks but our people have the strength of the will and steadfastness and are armed with patience and the ability to live in such severe conditions," said Haneya's statement. The Israeli army has been carrying out unprecedented intensive air and ground large-scale offensive on the Gaza Strip for consecutive eleven days, killing at least 590 people and wounded more than 2,600. Gaza doctors said that 200 children and 60 women were among the death toll, adding that 50 percent of those injured are civilians, most of them are women and children. Witnesses, who spoke in condition of anonymity, said that Gaza militants carried out rockets attacks on Israel from nearby houses, inhabited by civilians and leave the area immediately. They added that Israeli army tanks and warplanes fire back at the source where the rockets or the mortars came from, "where civilians' houses are hit and this leads to a high number of casualties." "This doesn't mean that the Israeli occupation is innocent, it is also involved in carrying out dozens of massacres against innocent civilians," said one of the witnesses. On Tuesday afternoon, Israeli warplanes hit with missiles a school run by the United Nations, which shelters dozens of families in Jabalia refugee camp in northern Gaza strip, killing at least 25 civilians, medics said. Mo'aweya Hassanein, chief of emergency and ambulance services in the Palestinian Health Ministry said that so far, Gaza hospitals received at least 25 people killed and dozens injured from the school in Jabalia. "Where are the Arabs and Moslems for what is going on in Gaza and how come the free Arabs and Moslems allow such awful massacres to be committed against our innocent people?" said Haneya.